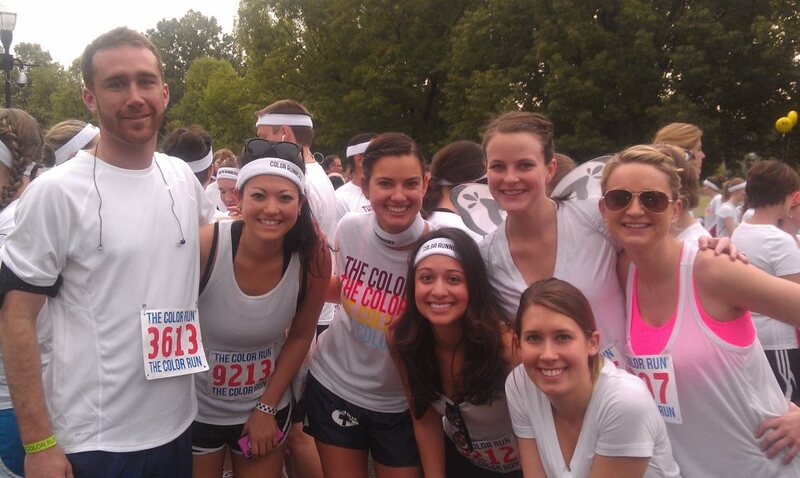 This past weekend was THE COLOR RUN! aka "The Happiest 5K on the Planet"
Basically, it's a 5K run and at every K they cover you in a different color. I honestly don't know how to explain it, so just watch this video and you'll get the point (and be jealous that you didn't do it!). We showed up bright and early all squeaky clean wearing our white clothes (as they suggest), and met up with the rest of our group at Piedmont Park. Don't we all look so lovely without makeup? There were seriously so many people. We were pretty close to the front (Wave 4), and the last group hadn't even gone when we finished! Seriously, so crazy. I've been trying to find an official count, but I can't find it anywhere. As you can imagine, it wasn't a serious 5K (they didn't even time you!). Actually, the majority of people walked, and there were so many adorable little kids just jumping around in the color and squealing. 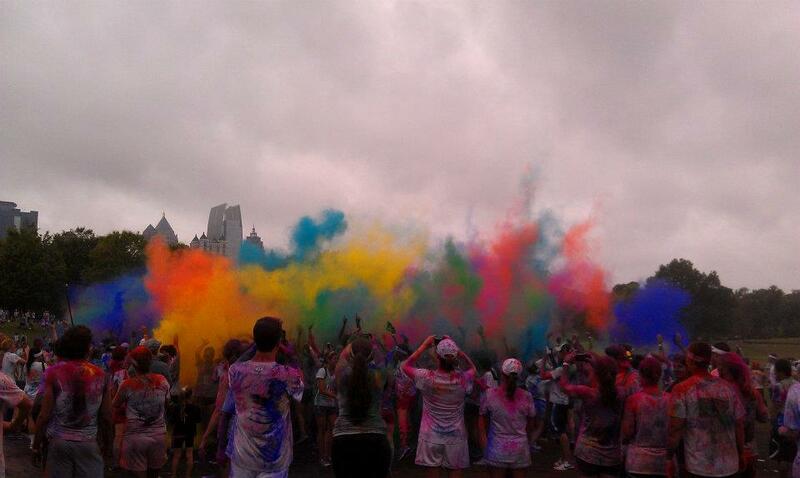 At the finish line, it's just a big crazy color party! It got a lot bigger than this, but since we were some of the first to finish, the crowd wasn't too big. I obviously didn't bring my camera or phone because they would have been destroyed, but here we are after walking back to Kelly and Jason's - THANK YOU for letting us park/use the bathroom/take pictures! Of course I wore wings. We were all so messy, but decided we couldn't head home quite yet. So we all went to Joe's on Juniper for brunch and celebratory mimosas! If you get the chance, you have to do it! It really is the happiest 5k on the planet! In other news, yesterday was Phoebe's first birthday! My parents and Mitchell are in Mexico for his Spring Break (ugh), so we are watching the Pheebster. So excited she can't even keep her eyes open! Ruthie joined in on the birthday celebration! I think this video is just so adorable - especially when Phoebe scooches over, and then Ruthie does too. And I have to finish off this post by bragging about myself. After finishing the 5K on Saturday, I woke up and ran 8 miles on Sunday! The half marathon is so soon, and I finally think I might not die. I'm sure all you runners out there are rolling your eyes, but I have never been a runner. Ever. I think it's the most horrible thing. If you're like me and don't enjoy running, check out this website: Reluctant Runners. You'll feel right at home!